We’ve already established the limitations of small samples and how tough it is to glean useful information from one game. But occasionally, we can in fact learn some things from a single game, when we’re watching something we’ve never seen before. For Wednesday night’s Marlins-Cardinals game (Cardinals 4, Marlins 1), that something was Marlins Park. Though we did get to see the showy new ballpark in action during the Marlins’ exhibition game against the Yankees, here was the first opportunity to see how it would play in a game that mattered, with both teams using their full allotment of regular players. At the risk of blowing nine innings way out of proportion, here’s what we’ve learned: Petco Park (and Safeco Field, and Tropicana Field) might have a new challenger for the title of toughest hitter’s park in baseball. Twice on Wednesday night, Giancarlo Stanton crushed balls deep, then briefly watched them carry, which is what you do when you think a ball is gone. Not even close. Stanton’s first missile just made it onto the track in center, where the sign behind center fielder Jon Jay said 418 feet (and 127 meters!). Stanton’s second launch sent Jay racing into the right-center-field gap, where he hauled in another ball at the track for a long out. Marlins Park might not have the same climate Petco does; a layer of often-present marine air teams up with deep dimensions to knock down seemingly anything that flies toward right and right-center in San Diego. But the broadcast team of Dan Shulman, Orel Hershiser, and Terry Francona parroted some of the concerns raised by others about the park, where the ball might travel even less when the roof and the windows leading out from the outfield are closed. We may not know that for a while. What we do know is that Marlins Park boasts one of the deepest sets of outfield dimensions in the majors. That raises the possibility that Stanton will glare at a lot more loud outs this season, and also that we might see batting averages creep up a bit with all the room to hit dunkers into shallow center in Miami. The second of World Series hero David Freese’s three hits on the night came on a big blooper to center that dropped in for a hit that might not have happened in several other parks. Hate the park for suppressing offense if that’s your jam. But the aesthetics can be highly defensible. 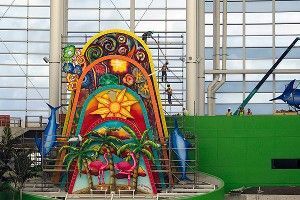 An art dealer by trade, Marlins owner Jeffrey Loria has long sought to build a baseball stadium with a modern and very different look, away from the typical template of nouveau throwback features that dominates so many ballparks. He wanted bright, eye-catching colors, such as the bright green swathing the outfield walls. Two fish tanks in foul territory at field level offer another funky element that sets the park apart. It’s just too bad we’ll likely get colorfully dressed Brazilian dancers escorting Marlins players out onto the field only for Opening Day, not for the other 80 home games a year. I choose to like it ironically. If the Marlins and the stadium’s architects think it’s actually in good taste and not taking the idea of original design ideas way, way, way too far, that only makes it funnier. Turns out the Marlins and Cardinals played a game, too, one dominated by Kyle Lohse. A cynic might look at Lohse’s day and say he got a little lucky. Taking a no-hitter into the seventh and allowing just one run and two hits in 7⅓ innings can look a little flukish when your starting pitcher records just three strikeouts and serves up 11 fly balls (several of them smashed, including Stanton’s two shots) to eight grounders. But that’s typical Lohse: Put the ball in play and hope your fielders can catch everything and that balls don’t carry over the fence. In a park like this one, Lohse is perfectly set up to succeed. It wasn’t quite Bob Feller’s Opening Day no-hitter or Walter Johnson’s 15-inning Opening Day gem 76 years ago. But it was more than enough for a Cardinals team that figures to hit again, but also needs to contend with Chris Carpenter’s early-season injury and the uncertainty surrounding Adam Wainwright’s return to the mound after missing all of last season following Tommy John surgery. then gave up on it, figuring new shortstop Jose Reyes would field it and throw Beltran out from deep in the hole. But Rafael Furcal had bluffed taking off for second, freezing Reyes just enough to enable this 57-hopper to trickle into left for a hit. Though the results put up by, say, Carlos Zambrano and Ricky Nolasco could prove more important to the Marlins’ fortunes, the team needs to hope the left side of its defense communicates well and shows the range to make tough plays. If not, everyone from Zambrano and Nolasco to staff ace Josh Johnson (as we just saw) could struggle to get out of innings as the team’s defense lets them down. • Jose Reyes cut his hair? Boo! • “That’s the Greg Dobbs Factor.” —Terry Francona, discussing Dobbs’s big potential impact as a pinch-hitter for the Marlins. Dobbs owns a .294 on-base percentage over the past three years (hat tip to FanGraphs’ Dave Cameron for noticing), with WAR numbers that make him look like a typical replacement-level player. • “What a weapon.” —Francona, who apparently can’t get enough Dobbs compliments in there. • Lance Berkman made a nifty scoop of a throw from second to end the eighth inning. First-base umpire Angel Hernandez, widely known as one of the worst umps in the game, blew the call, saying the runner was safe. The call led to just one Marlins run and thus had little to no bearing on the final outcome of the game. Still, these are easily fixable problems, though MLB seems content to look foolish as flawed individuals try to do what robots should be doing right now. • Finally, a word about the pageantry of the day from a personal standpoint: It hurt like hell. 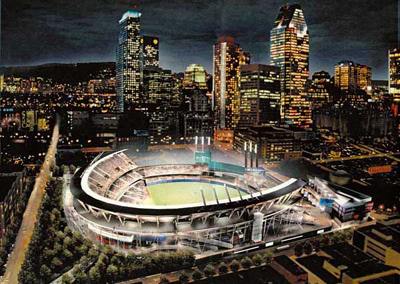 More than a decade before Loria got his wish for a uniquely designed stadium in Miami, he lobbied for one to be built in the heart of downtown Montreal. The easy move is to blame Loria for failing to get the park built, bolting for Florida and leaving the Expos franchise to twist in the wind. In reality, many other factors wiped out not only Montreal’s shot at a new ballpark, but also the Expos’ ultimate ability to keep playing in la belle province. So when I clicked on the TV and saw everyone from the announcers to third-inning guest Bud Selig waxing rhapsodic about Marlins Park, the transformation of the Marlins franchise, and the future of baseball in South Florida, it was unexpectedly sad (horrible, really) for an old Expos fan to watch. It was like having the love of your life leave you at the altar, marry your next-door neighbor whom you hate, then send you a live HD feed of them doing it 81 days a year. would Jose Reyes, Mark Buehrle, and Heath Bell have signed elsewhere? Would the Marlins be talked about in the same breath as the A’s and Rays, as desperately needing a new ballpark or else running the risk of franchise relocation? The Marlins’ future outlook changed dramatically as soon as ground broke on the new stadium, and the NL East’s standings could change dramatically in the coming years as a result. But tweak one event from a decade ago and everything could have looked so different. If you’re a fan of giant, neon fish whooshing through the air in a hail of fireworks, be thankful things turned out the way they did. Josh, Will You Go To Prom With Alaina?